This kit includes furling line, 1 pulpit mounted ball bearing fairlead, 3-4 intermediate stanchion mount fairleads with stainless steel inserts, one deck mounted fairlead and a deck cleat. Also included is all necessary screws and hardware. This kit is recommended for most boats using CDI and Profurl units. Carbo Furling Lead Block Assemblies. These strong, lightweight blocks feature free-rolling ball bearings to lead line aft for safe furling from the cockpit. This kit allows the furling line to be routed outside the stanchions to keep the sidedeck clear. Blocks mount with a strong four-screw clamp without removing the stanchion or lifelines. The cockpit ratchet block provides drag on the line when unfurling to control spooling so unit furls more evenly. 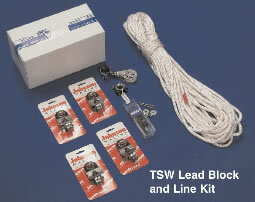 The 7404 lead block kit provides a complete system for most boats (one size fits all). • Cleat for furling line. (Furling line is already included with Harken Furling Units so it is not supplied here). These common boats usually require headstay replacement when installing either Harken #00 or CDI FF2 Units. If the old headstay has a teardrop shaped thimble swaged at the bottom, it will not pass through the foil for installation. Therefore it must be cut or replaced. Our headstays have a marine style turnbuckle. When you remove the barrel the remaining screw is only 1/4” dia. so it is allowed to pass through easily. Wire diameter is 1/8” with 1/4” pins top and bottom . Toggle & turnbuckle are included. Headstays are sold with furler purchase only. 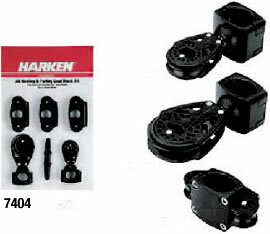 Harken MKIV and Cruising Units will usually require shortening or replacing the headstay for installation because of the added length of the toggle at the bottom. Often customers will replace the headstay at that time, especially if the rigging is more that a few years old. To replace your headstay when installing your new furler call us with your “pin to pin” dimension as described here. (The dimension between the center lines of the clevis pin holes at the mast head connection and the stem fitting at the bow of the boat (with turnbuckle in normal adjustment). Also provide wire diameter and pin sizes both top and bottom. Custom headstays take about 3 - 5 Days to make.